This terrier originates between the border of England and Scotland around the 1700’s. 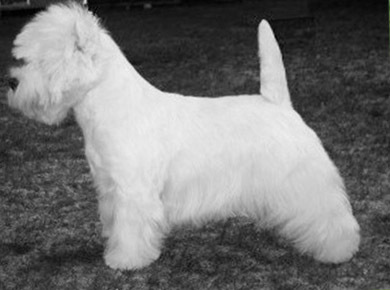 They evolved from the crossing of the Skye Terrier and the Scotch Terrier (extinct). Their name comes from a fictional character called Dandie Dinmont who was created by the writer Sir Walter Scott in 1814. Like dachshunds they have remarkably short legs which originally helped their specialty of hunting badgers and otters. They were also used by gypsies to kill vermin around their camps, but in modern times are an excellent companion dog. They are affectionate, courageous independent and intelligent dogs however their hunting instinct means they need to be separated from smaller pets in the house. While they can be trained their independent streaks often requires regular lessons. Their hunting character makes them an excellent watchdog, but they must be corrected if they do not settle after the initial barks. Without consistent firm training they can develop stubbornness, guarding and separation anxieties. Daily pack walks and socialization can go a long way towards correcting any unwanted behaviors. The Dandie Dinmont typically will have either a pepper or mustard color coat. Dandie Dinmont Terrier grooming: These dogs have a unique 5 cm coat that is a combination of soft and wiry hair. The hair on the Dandie’s upper body is harsher than the hair underneath. Regular if not daily brushing is recommended for their long coats. Dead hair must be plucked from the coat several times per year. This is a fierce hunting dog that is often babied because of its size and cuteness that can lead to some annoying behaviors. Their willful, persistent, and independent strengths can quiekcly turn to stubborn, independent (poor recall) traits. Treated correctly, and given suitable interaction each day, will ensure a loyal loving pet. Just don’t trust it with your guinea pigs or cats. This entry was posted in Dog Hunters, Terrier Dogs.